Council’s brilliant planning has provided another developer with a major bonus. This concerns 285 Neerim Road, Carnegie. A permit was granted by VCAT in 2015 for a 4 storey and 41 apartment block. Residents will remember that in 2017 council produced its first version of its structure plan which was gazetted as an interim height amendment (C148) in 2017. The site was then designated as having a four storey mandatory height. With the latest version as of August 2018, the site suddenly became suitable for a 5 storey mandatory height limit. No explanation of course as to why within the space of a year council (and the minister) saw fit to increase the height in this area. The developer has decided that instead of 4 storeys, he wants 5 and instead of 41 units he is aiming for 46. Visitor car parking will go completely and there is even a further reduction in the requisite parking for retail/shops from 20 to 16. And of the 46 proposed apartments, 33 are two bedroom, 9 are one bedroom and the magnificent total of 4 as three bedroom. That makes it a total of over 91% as one and two bedroom dwellings. So much for ‘diversity’ as required in the planning scheme! What irks us about this application is not the right of the developer to ask for more. He is perfectly entitled to. The concern resides with council’s failure to offer any justification for its decisions, much less listen and act upon resident feedback. How any reasonable person can accept that in April 2017 council proposed and the Minister agreed that 7 storeys was needed to protect again ‘inappropriate development’ and then in just over a year to suddenly use the same argument and claim that 12 storeys is required to avert ‘inappropriate development’ is simply mind boggling. And yet our illustrious councilors did not bat an eye but voted this in! Thank you indeed councilors for your ineptitude and disregard for the community! Residents addressed council tonight on the proposed sell off of our aged care facilities. All speakers performed wonderfully well = articulate, informed, concerned, and passionate about preserving this service for the long term. We present below one resident’s submission. Please listen to this carefully since it summarises beautifully how council has failed its community and the lack of transparency. 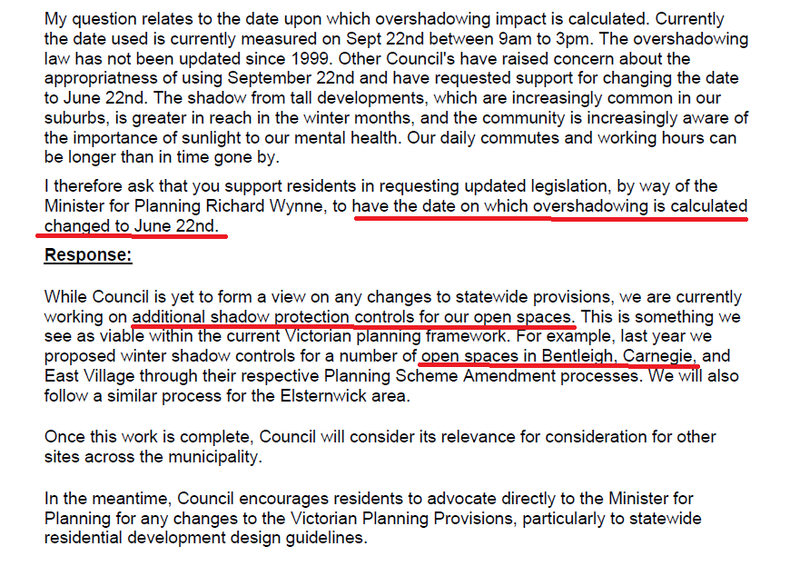 We also note Hyams’ fumbling and disingenuous response to the issue of the lack of community consultation. When council makes this audio available it is worth listening to simply because of his pathetic attempt to defend the indefensible.